Little River Trail, located in the Elkmont area of the Great Smoky Mountains National is a fun trail full of interesting history. Little River is a an out and back trail, with an optional loop. Keep reading for lots of photos and more information on this historic trail and area. Directions: From the Sugarlands Visitor Center near Gatlinburg, travel along Fighting Creek Gap Road for 4.9 miles on towards Cades Cove. Turn left onto Elkmont Road and drive 1.4 miles to the campground. Just prior to entering the campground, turn left onto Little River Rd and follow it to the trailhead parking lot. Recommended Gear: Digital camera and other day hiking essentials. There are also some great wading areas in the water, especially for kids, so we would recommend bringing a few towels, bathing suits, and some water shoes. Little River Trail begins at the trailhead parking lot, next to the Elkmont Campground and historic homesites of the Appalachian Club. The trail follows along side Little River, and provides a gradual uphill grade. 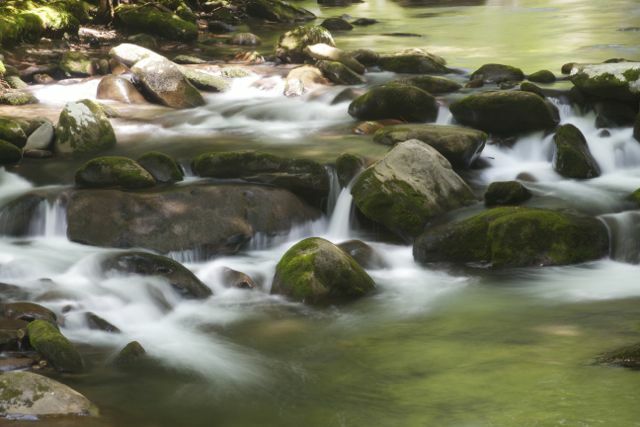 Little River is a beautiful and scenic river full of cascades of various sizes, deep pools, and large boulders. The trial is an old logging railroad roadbed, and is an even and moderate hike all the way up. The first part of the trail will take you past a few old buildings from the historic Appalachian Club. The Appalachian Club was a former vacation resorted, located next to the former Elkmont logging town. The Appalachian club began as a “Gentleman’s Hunting Club”, but soon evolved into vacation resort. The initial part of Little River Trail will take you past a few of the old vacation homes, built in the early 1900s. Most of these homes were used by the affluent of Knoxville as a mountain escape. In the 1920s and 1930s, Tennessee began acquiring property for the Great Smoky Mountains National Park, and many of the homes and associated land where purchased outright. Some home owners negotiated leases, that expired in 1992. The plan for these homes is to restore 18 of them, and make them available for people to enter and enjoy. The remaining structures will be torn down and removed, allowing the area to return to it’s natural historic beauty. While tempting, be sure to avoid entering the buildings. The park has very clear signs warning that entering the buildings is unlawful – You can be fined up to $5000.00 and receive jail time. One very interesting stop that should be on your list is a small stone bridge that is a little off the trail. The bridge is often called the “troll bridge”. A few hundred feet up from the trailhead is a gravel path going to the right. Follow this path down, and to the left you’ll see the “troll bridge”. The bridge was part of the historic community, and I’m sure served as part of a popular walking or bike riding trail in it’s day. As you leave the Appalachian Club area, the trail will continue it’s slow and steady climb upward. This old railroad grade was used by the Little River Logging company, which built rail lines for the purposes of getting logs to Elkmont from within the Park. This logging company owned all of the land around Little River, and this spur of the railroad ran all the way to Clingmans Dome. Little River, to your left will never be too far, and only for a short part of the trail will you actually stop seeing and hearing it. Along the way, to your right will be steep upward grades, and to your left little river and it’s numerous cascades and pools. There are a number of “unofficial” access points to Little River for wading and swimming. A few of them are pretty steep so be careful. In the late 80s and early 90s, the National Park service released River Otters into this area. Keep an eye out, and if you’re lucky, you might just spot one! At the 2.2 mile marker, you will reach a wooden bridge that crosses Huskey Branch Falls, a small 20 foot or so cascade that flows down the mountain to your right, under the bridge and into Little River. The small falls is beautiful, and due to the strongly rushing water, has a very pleasant sound. There is a small trail to the left, just before the bridge that provides access to the area below the falls. The “unofficial” trail is steep and the rocks below are slick, so be careful! Also, the drop off the left side of the bridge is tall, and there are no rails, so keep an eye on small children. At 2.6 miles, you’ll reach a large clearing, and the intersection of Cucumber Gap Trail. This is where most people either turn around, or head down Cucumber Gap Trail which will take you back to the upper portion of the Little River trail parking lot. We elected to continue on up Little River Trail for another half mile, as I had heard there as a nice swimming area under an old railroad bridge. As a huge Railroad enthusiast, I just could resist seeing the bridge. Sure enough, in about .4 – .5 miles up, you’ll see the ties for the old Logging Railroad bridge. If you walk across it, there is access to the “beach” area below the bridge to your left. It’s a bit steep, and avoid stepping on the rocks, they’re slick! Trust me, I learned this firsthand. We stayed in this area for well over an hour, allowing our kids to wade and play in the water, and my wife and I taking photos. This area is pretty remote, and we only saw a few people walking up on the bridge. While not one of our favorite trails, it was certainly a nice one. The trail is busy, but not so much so that you lose the feeling of being miles out in the woods. The old railroad grade makes for a smooth and moderate hike, that is easy on your feet and legs. The really nice thing about the trail is the water access and numerous boulders for just sitting and enjoying the sites and sounds of the water. This is a good hike, and excellent for families and beginning hikers looking for a relatively easy trail.